Crawl space vents can usually keep out mice and rodents, but what about termites, carpenter ants, and other insects? Crawl Space ventilation is the answer that contractors have historically given to the issue of crawl space humidity in homes. Generally, this involves installing vented openings in cross-sectional area equal to 1/150 of the floor area served. 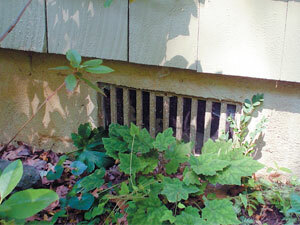 These crawl space vents are usually fitted with a covering -- usually a wooden/metal grating, or a mesh covering. The covering is installed to prevent infestations from rodents and animals, but they cannot prevent insects such as termites and carpenter ants. Crawl space ventilation moves outside air through the house. This affects utility bills and, when that air holds mold spores, your health. Crawl space ventilation was meant to keep a constant supply of fresh air circulating throughout the crawl space environment. It was thought that this would help to purge the space of the heavy, damp air in the house that settles in the lower levels. Additionally, some contractors claim that damp, humid air is heavier than dry air, causing all the moisture in the home to sink down into the crawl space. This belief had become so widespread that crawl space vents were actually written into the International Building Code! This, unfortunately, is not true. In fact, humid air is much lighter than dry air! This means that systems that are designed to pull the "dry" air from the upper levels in the house into the crawl space are doing much more damage than good-- and costing you extra money on your utility bills. In recent years, these codes are quickly changing to reflect improvements in the industry and scientific study. Isaac Newton discovered in 1717 that wet air is actually lighter than dry air! It makes a lot of sense - if damp air was heavier, what would clouds be made of? And why would crawl space vents, which are at ground level, ever bring dry air into your home? If it's rainy, humid, foggy, or snowing outside, you're bringing wet air into your home. Advanced Energy reports that crawl space ventilation brings wet air into your home [PDF] when it's wet outside. Water that is pooling around your vents, will also flow into the space. Crawl space moisture helps mold, rot, and mildew grow. This means serious damage for your crawl space! 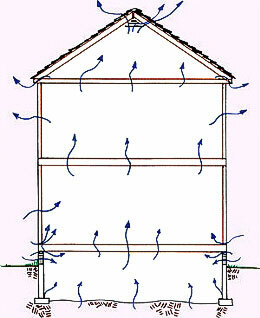 Here's a little more science: Hot air rises, leaving your house through the roof and upper levels. This creates a vacuum below that is filled by air from your crawl space, basement, and from outside. Air in your crawl space eventually enters the rest of your home! Winter Air - Frigid air fills your crawlspace, making the floor above cold. It cools your hot water pipes, your water heater, your furnace, and your heating ducts. Your utilities work harder and cost you more to run, and your home is drafty and uncomfortable. Summer Air - Hot, humid air enters the crawl space, where the earth cools it naturally. According to Builder Magazine [PDF], this humidity will lead to condensation on your pipes, wood, and cool surfaces, leading to mold and rot. Damp air rises upward into your home. Wet air is harder to cool than dry air, and you spend more on utilities. 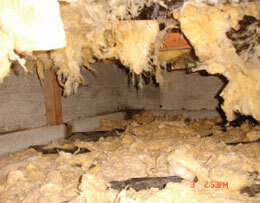 Meanwhile, your crawl space insulation gets wet, loses its insulation value, grows mold, and drips to the floor. Moist, rotting wood is a perfect place for termites, ants, rodents, and other creatures to move in! When crawl space insulation is saturated with water, it drips off onto the floor. Crawl space ventilation does not work. If your crawl space is rotting and moldy, then you already know this. Seal your crawl space vents and doors with airtight covers. Install a self-draining, strong dehumidifier in the crawl space. This keeps everything you don't want in your crawl space outside- including moisture, cold air, termites, and ants. Your crawl space will be dry and usable as storage space, and as an added benefit, a crawl space liner will even serve as a passive radon mitigation system! BlueMaxx Basement Systems would like to help you create a dry, healthier crawl space. If you'd like a free, on-site consultation, call or e-mail us today! 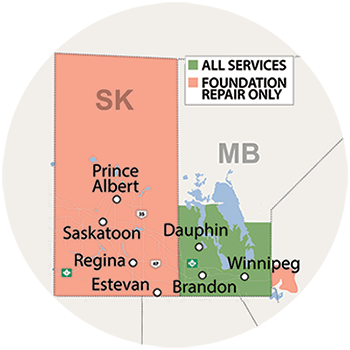 We service Manitoba, including Winnipeg, Arnot, Brandon, Brochet, Dauphin, Island Lake, Little Grand Rapids, Lynn Lake, Melita, Nunalla, Port Nelson, Russell, Swan River and nearby areas.